Length: 78 to 85 cm; Wingspan: 230 cm; Weight: 3300 to 5300 gr. White-headed Vulture has dark brown plumage on neck ruff and breast band. Large wings are brown with white edges in median upperwing coverts. We can see a white line along the ends of greater underwing coverts. Flight feathers and tail are black. It has white throat. Lower breast, belly and thighs are white. White-headed Vulture has a broad, triangular, unfeathered head. It has white down on crown and nape, forming a slight crest. It has bare pink skin around the eyes, and in cheeks and fore neck. Hooked bill is orange with black tip. Cere is sky blue as base of the bill. Eyes are small and dull orange. Bare legs and talons are pinkish orange. Sexes are similar in size. Female has white inner secondaries, forming a white rectangular patch on the inner wing. Male has dark secondaries. Juvenile is dark brown with white head and brownish top of head, and white mottling on mantle. It has dark underparts. It needs about six years to reach its adult plumage. In female, rectangular white patches appear when it is two years old. 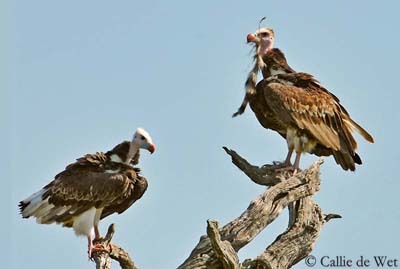 White-headed Vulture is usually silent, except near carcasses where it can utter a shrill chattering to defend its food. 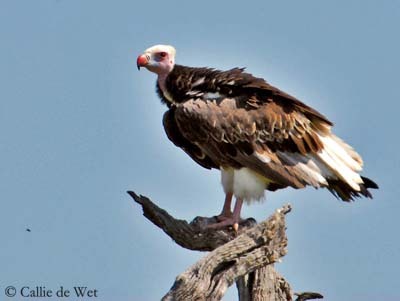 White-headed Vulture lives in dry regions, in open areas such as plains, even desert. It is found in open savannahs and thorn bush. White-headed Vulture is resident in Africa, living in open savannahs in Sub-Saharan Africa. 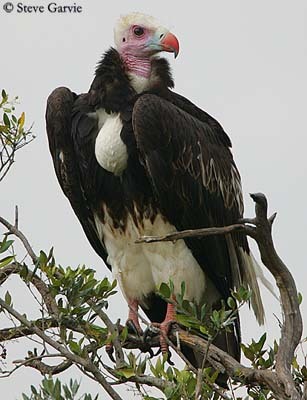 White-headed Vultures are often seen alone or in pairs, perched in trees or near carrion on the ground. They locate food while soaring. They observe the movements of the other scavengers, before to descend from their high soaring flight. Then, they land into a tree or on the ground. They usually stand at the edge of flocks of other vultures species, because they prefer to feed alone. But, they can dominate other vultures when necessary. 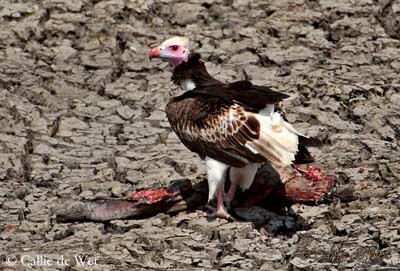 This vulture is usually the first to find a carcass, and to land and start feeding. It prefers to walk off with a piece and feed alone. White-headed Vultures are able to eat any piece of carcass, except the skin, and include ligaments and bones, but they are “clean” feeders, without blood on their feathers. It may be both scavenger and predator. It is known to hunt live prey to supplement its diet. With their strong talons, they are able to tackle prey as flamingos, and they will occasionally take small antelopes. This vulture prefers freshly killed prey, unlike other vulture species. They often land the first to a carcass, but they immediately dominate the group. Even arriving alone or in pair, they will push all the others out of their way, except the powerful Lappet-faced Vulture. White-headed Vulture is nimble on the ground, and keeps a good poise. It fights by leaping into the air, and lashing out with talons. White-headed Vulture roosts at night solitary or in pairs, perched on trees. They are very shy vultures. White-headed vulture soars for much of the day, with flat wings, to locate food. 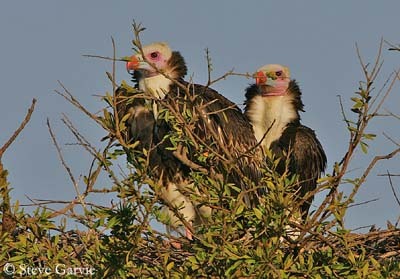 White-headed Vulture’s nest is situated on the top of a tall tree, such as a baobab or an acacia, emergent from surrounding woodland. Nest is a large platform made with sticks, and sparsely lined with dried grasses. Little by little, this lining becomes covered by disintegrated pellets. Breeding season occurs from May to August. 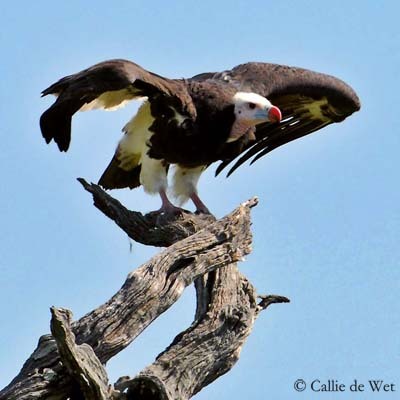 White-headed Vulture populations are threatened by the effects of poisoned baits laid for small carnivores. Destruction of habitat with removal of vegetation cover plays an important role in decline in some parts of Africa. It is now confined in protected areas. They are very vulnerable to disturbances when breed, and readily abandon the nest. Female lays only one white egg, spotted with reddish-brown and lilac. Incubation lasts about 43 to 54 days, by both parents. Chick is fed by both parents, by regurgitation mouth-to-mouth. It remains at nest about 115 days, where is fed by adults. After fledging, parents feed it at nest during six months more. White-headed Vulture feeds mainly on carrion, but it also consumes freshly killed prey such as flamingos, small mammals and lizards. They also eat stranded fish, termites and locusts when they find them.